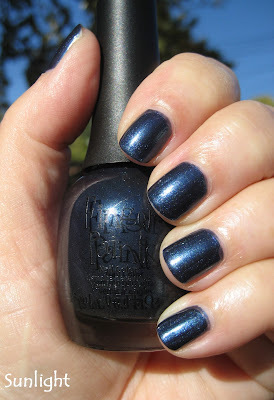 remind me of SinfulColors "Hot Spot" I like this kind of dark blue with shimmer. Oooo, I like this! Thanks for posting. I just bought this color at Sally's. I can't wait to try it out. It looks very pretty in the pictures! Ooh, very nice! I like dark blues and greens that don't turn black. Love that blue polish on your Mother. Very pretty.